The commutating components L and C are connected in series with the load therefore this inverter is called as series inverter. The value of commutating components is selected such that the circuit becomes under damped. The anode current itself becomes zero in this inverter resulting the SCR turns off automatically therefore this inverter is also called as self commutated or load commutated inverter. 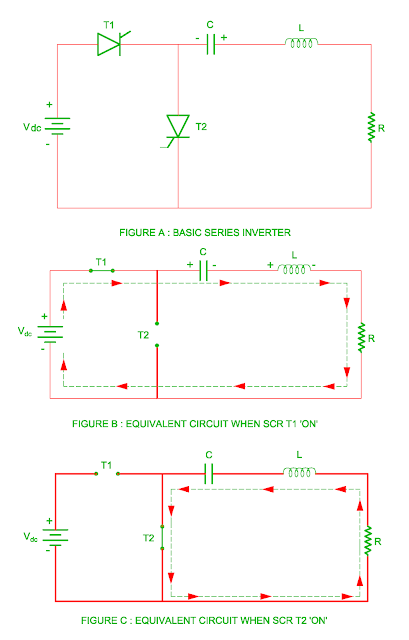 The power circuit diagram of the series inverter is shown in the figure A. The SCR T1 and SCR T2 are turned on at regular interval in order to achieve desirable output voltage and output frequency. The SCR T2 is kept off at starting condition and polarity of voltage across capacitor is shown in the figure A. The operation of the series inverter is explained as follows. The voltage Vdc directly applies to RLC series circuit as soon as the SCR T1 is turned on. The polarity of capacitor charging is shown in the figure B. 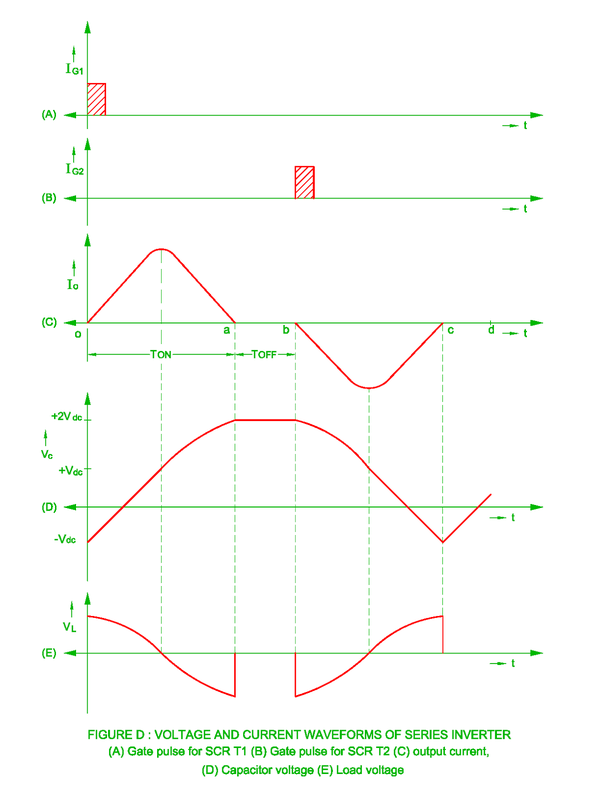 The nature of the load current is alternating as there is underdamped circuit of the commutating components. The voltage across capacitor becomes + Vdc when the load current becomes maximum. The voltage across capacitor becomes +2Vdc when the load current becomes zero at point a ( figure D ). The SCR T1 automatically turns off at point a because the load current becomes zero. The load current becomes zero from point a to b as the SCR T1 turns off in this time period. The SCR T1 and SCR T2 are turned off in this time duration and voltage across capacitor becomes equal to +2 Vdc. The SCR T2 is turned on at point b due to it receives positive capacitor voltage. 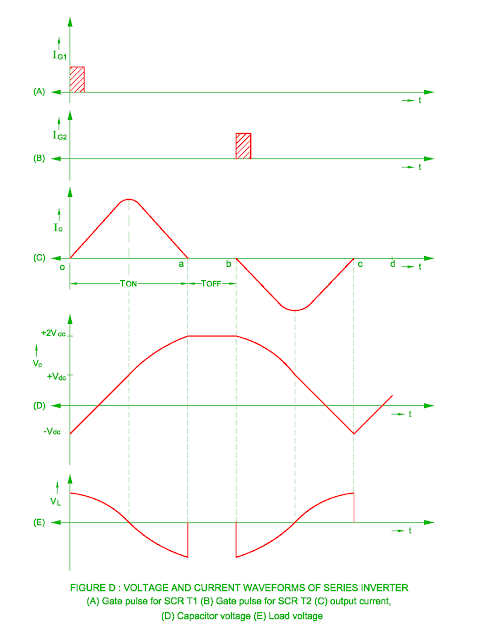 The discharging of capacitor is done through SCR T2 and R – L circuit as shown in the figure C.
The load current becomes zero after it becomes maximum in the negative direction. The capacitor discharges from +2 Vdc to – Vdc during this time and SCR T2 turns off automatically at point C due to load current becomes zero. The SCR T2 turns off during point C to D and SCR T1 again turns on. This way cycle repeat after it complete one turns. The positive AC output voltage half cycle generates due to DC voltage source whereas negative half cycle generates due to capacitor. There is always some time delay kept between one SCR turned on time and other SCR turned on time. The DC output gets short circuited due to continuous conduction of both SCRs if there is no time delay between SCRs. The time duration ab and cd must be greater than the SCR specific turn off time and it is called as dead zone. 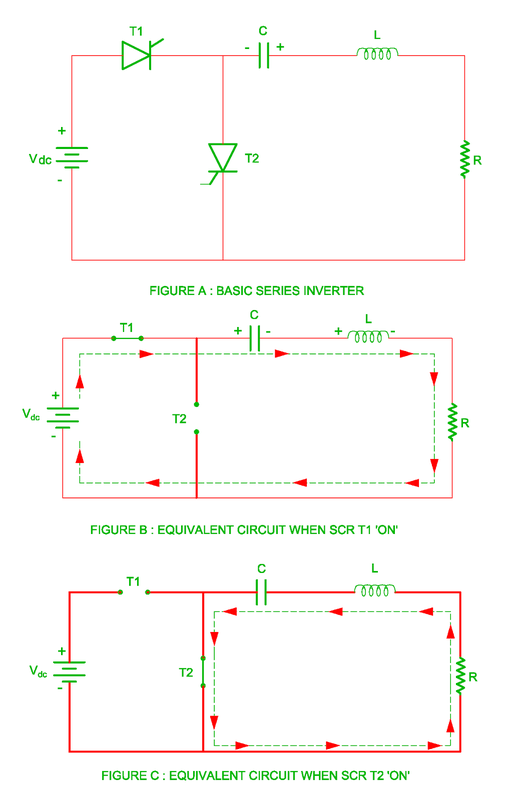 The limitation of series inverter is as given below. The load current flows only during positive half cycle from supply source. The DC supply source gets short circuited if SCR T1 and SCR T2 simultaneously turned on. The rating of commutating components should high because the load current flows through it. The load voltage waveform gets distorted if the dead zone time or SCR turns on time high. The maximum output frequency of the inverter should be less than the ringing frequency. The DC supply source is short circuited if the output frequency of the inverter is higher than the ringing frequency. The maximum current during each half cycle and its time duration depends upon parameter of load this will result in poor regulation of the inverter output.